Grilling tools can get pretty greasy, grimy and even rusty, particularly if you do not clean them after each use and properly store them out of the elements. If your barbecue utensils have seen better days but you are not quite ready to invest in a new set, here are some easy, inexpensive ways to remove rust, cut through the cooked-on grease, and bring your tools back to their former glory. Even well-made, stainless steel grilling tools advertised as rust resistant or rust proof can eventually begin to rust. This is particularly true if they are left outside or if you have used a cleaning product or tool that has damaged the chromium protecting the surface of your utensils. If the rust is significant and you are concerned about the safety of using your grilling tools, it may be time to invest in a new set of outdoor cooking utensils. However, if there is a just a small or moderate amount of rust – or you have a lot of patience and do not mind putting in the effort to remove heavy rust – you can salvage your old barbecue tools and continue using them for years to come. There are commercial rust removers available, such as WD-40 Rust Remover Soak and Evapo-Rust Super Safe Rust Remover, which are non-toxic and biodegradable. However, while these products are sometimes used on grills and other outdoor cooking surfaces, it is best to use natural products that are specifically known to be food safe when removing rust from grilling tools. You can also save money by skipping store-bought cleaners and using products you likely already have in your kitchen. Before we get into how to remove rust from grilling utensils, let’s first look at a few more options you should avoid. Anything that could scratch the surface of your tools should be avoided, since this will only increase the potential for future rust. This means that rust-removal favorites, such as steel wool, wire brushes and crumpled balls of aluminum foil, may work wonders on gardening tools and wrenches but are not good choices for cleaning cooking utensils. Your best bet for naturally removing rust from grilling tools is to gather baking soda, vinegar, water, a small bowl for mixing, a bucket, a soft-bristled brush, and a sponge or soft cloth. Most folks already have these items, and this combination of products gives you a couple of options to try to see what is going to work best on your utensils. The first rust-removal trick to try is to make a thin paste with baking soda and water. Apply the paste to the rusted areas, allow it to sit for a few minutes, and then gently wipe the paste away with a sponge or soft cloth. If this is not quite enough, try applying the paste, waiting a few minutes, and then removing it by gently scrubbing the rusted areas with the scrubby side of a kitchen sponge or a soft-bristled brush (like a toothbrush). If this basic rust-removal technique is not doing the job on heavily rusted utensils, knock off any loose debris, wet the utensils, and pour baking soda directly on to the rusted areas. Leave the baking soda on the utensils for about an hour before scrubbing the rusted areas with the toothbrush or other soft-bristled brush. Use water to rinse off any remaining baking soda, and then dry your tools to avoid further rusting. If you are hoping to remove rust from grilling tools with a little less scrubbing, you can try soaking them for a few hours in a bucket of cola or vinegar. Depending on how much rust you have on your tools, this could take as little as a couple of hours or as long as a few days. The key is to check on your utensils regularly while they are soaking, since these products will also damage the metal if they are left soaking too long. If you forgot to clean your barbecue tools after your last cookout and now you are wondering if removing the cooked-on grease and grime is even possible at this point, there is hope. In fact, it might be as simple as soaking them in a bucket of hot, soapy water. Choose a dish soap specifically designed to cut through tough grease, squeeze a few drops into a bucket of hot water, agitate the water to create soapy bubbles, and then place your barbecue tools in the bucket. Leave them in the bucket for 30 minutes to an hour, and then use a scrubby sponge or soft-bristled brush (like a toothbrush) to remove the grease, grime, and cooked-on food. Rinse your cooking utensils and dry them with a soft cloth. If this does not work, it is time to up your grime-removing game with the acid in coffee. Buy some inexpensive coffee and brew it in your coffee pot or in a stock pot on the stove. If you brew the coffee in a coffee pot, pour it into a stock pot or other container that can withstand the heat, and then place your dirty grilling tools in the pot. If you brew your coffee in the stock pot, remove it from the heat, and then place your tools in the pot. Allow them to soak in the coffee for about an hour, and then rinse the utensils in hot water and dry them with a soft cloth. You may need to use a sponge or toothbrush to remove any particularly stubborn spots. Keep in mind that coffee can discolor the wood on older tools with wood handles. Spraying the metal parts of your utensils with a light coat of cooking oil or using a cloth to apply a light coat of an oil with a high smoke point can help prevent your tools from rusting between uses. The best way to keep your barbecue tools clean is to wash them after every use and store them inside. If you must store them outside, keep them in a drawer or case that will protect them from the elements and keep them clean between uses. It may be convenient to hang them on the hooks on the side of front of your barbecue grill and store them there between uses, but they will get dirty, which means they are not really ready to go next time you fire up the grill and will need to be washed before use anyways. Most grilling utensils can be washed in the dishwasher, which is also a great way to sanitize any utensils that touch uncooked meat, but keep in mind that cooking utensils with wood handles should not be placed in the dishwasher. 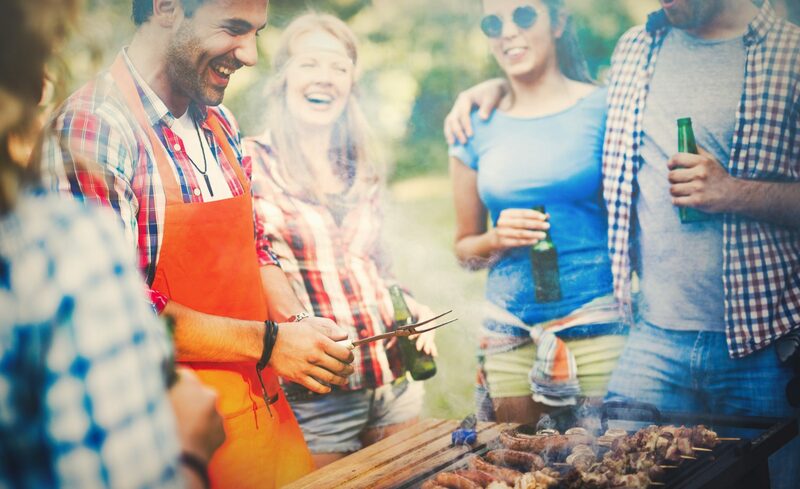 To keep grilling tools clean while cooking outdoors, keep a bowl or small bucket of warm, soapy water near your grill. When not in use, place your utensils in the bowl or bucket. When you need a spatula or meat fork, simply remove it from the soapy water, dry it with a kitchen towel, and it will be clean and ready to use. If you regularly grill large meals that involve meat, invest in two sets of barbecue tools. Keep one set of utensils on the left side of your grill for use with uncooked meat and another set on the right side of your grill for use with cooked meats. Keeping them on different sides will make it easier to remember which tools to use at which point in the cooking process. This will help reduce the potential for transferring bacteria found on uncooked meats to your cooked meats.